MYIR has recently introduced MYD-AM335X development boards and MYC-AM335X CPU modules powered by Texas Instruments Sitara AM335x ARM Cortex A8 SoCs, (AM3352, AM3354, AM3356, AM3357, AM3358, and AM3359) that come with 512 MB RAM, 512 MB Flash, and a Gigabit Ethernet PHY. The boards and modules target home automation, industrial automation, enterprise/educational tablets, portable navigation devices and networking applications. The company provides Linux 3.1.0, Android 2.3.4 and Windows Embedded CE 7 BSPs for these modules. MYIR also provides a baseboard, which when used with their MYC-AM335x CoMs is called MYD-AM335x. 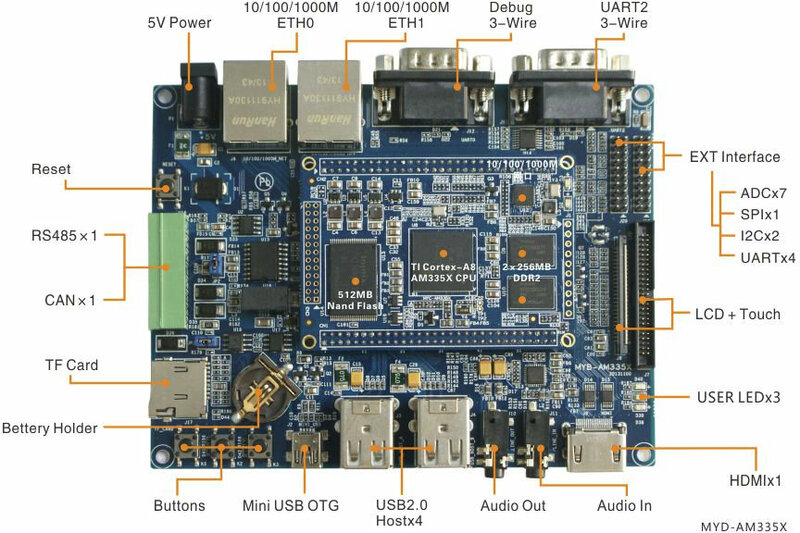 The board is sold as part of MYD-AM335X development kit that also includes an Ethernet cable, a USB cable, a 5V power adapter, and a product DVD. Optional 4.3″ or 7″ LCD/TSP are also available. The development kits and CPU modules are available now starting at $68 per unit for the CoM and $139 for the development board per 1k order. You can visit MYIR’s MYC-AM335X CPU module page for more information about the CoMs and development boards.